Thanks in large part to its range of creative filters, Instagram has quickly risen to become one of the most popular image sharing social networks. While using Instagram is reasonably easy, there are a number of reasons why someone may want to delete or deactivate their Instagram account. There are some concerns over usage rights, privacy and security, for example. Permanently deleting or temporarily deactivating an Instagram account is very easy to do, but it can also present some challenges. Deleting an Instagram account is irreversible. Do not proceed unless you are absolutely certain that you would like to deactivate your account and profile. If you have any hesitations whatsoever, consider temporarily disabling your account instead. Before deleting an Instagram account for good, it is generally recommended that users first download all the images that have been uploaded to their accounts. Once your account is deleted, you will no longer have access to any of the photos that have been shared through the site. Once you have downloaded a local archive of your Instagram photos, you can proceed to delete your account. A third-party service called Instaport is a good solution for creating a backup archive of all the photos from an Instagram account. Click the 'Sign in with Instagram' button and enter your account credentials. Click to authorize access to your Instagram account. Choose your export options. You can download all of your photos (recommended), your most recent photos, or all photos between defined dates. You can also download photos with a certain tag and photos from others you liked. There is a beta option to download Instagram videos as well. Click 'Start Export' to download the archive as a .zip file. Unzip the .zip file from your local hard drive. After creating a backup archive of all the photos uploaded to the account, you can then proceed to delete your Instagram account. Open a web browser on your computer. You can also do this through the mobile browser on your smartphone or tablet, but it is easier to navigate through a desktop or notebook computer. You cannot delete your account from the Instagram mobile app. Click the 'Log in' button and enter your Instagram username and password. After logging in, visit the 'Delete Your Account page' on Instagram. Select the reason why you are deleting your account from the pull-down menu. Re-enter your password in the field that appears. Click the 'Permanently delete my account' button near the bottom of the page. Is the Account Really Removed? When you delete your Instagram account, it is immediately removed and it cannot be recovered. Furthermore, after an account has been deleted, you will not be able to sign up using the same username or e-mail address again. All the data associated with the account - including photos and videos, as well as friend lists, image captions, comments, likes and other information - will be deleted and made unavailable for public access. However, Instagram may still retain copies of the data (including all the photos) on its servers for an indefinite length of time. So, while the account has been technically deleted, it may not be completely removed. It has been said that the Internet is forever. This is because anything that has been uploaded or published on the Internet has likely been backed up on another server or another website already. This is the case with Instagram and other social media platforms. This is one of the inherent dangers of social networking. Since deleting an Instagram account is permanent and non-reversible, it may be more advisable to consider temporarily disabling your account instead. When you do this, your account is hidden from public view immediately, but all of your content- like your photos, comments and likes - are still retained and can be reinstated when and if you choose to reactivate your account. Click the 'Edit Profile' button next to your username. Choose your reason for disabling your account from the drop-down menu. You can disable your account up to once a week. If the primary reason you are considering deleting or deactivating your Instagram account is to prevent someone from viewing your photos, making your Instagram profile private may be a better alternative. This way, your profile and your pictures are not publicly accessible. Instead, you must approve each friend who wishes to view your profile. Go to the tab with your profile (the last one on the right). Tap the 'Edit your profile' link near the top. On the resulting page, one of the checkboxes is 'Posts are private.' Tick this and other users will need authorization from you before they can follow you. Existing followers are not affected. 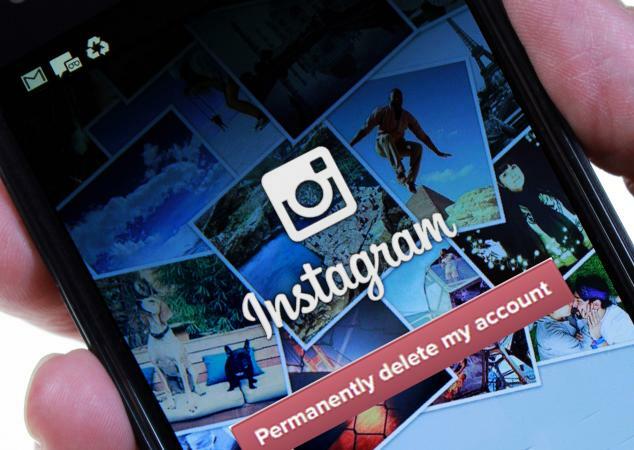 Only an account holder can delete or deactivate his or her Instagram account. Instagram will not delete an account on your behalf. If you've forgotten your password, you'll need to reset it before you can make changes to your account. Use the 'forgot password' utility from the Instagram homepage to reset your password, log into your account, and follow the steps to delete, deactivate or adjust the privacy settings on your account.